Innovation is “The act of introducing something new”. The Free Dictionary. “Innovation generally refers to renewing, changing or creating more effective processes, products or ways of doing things.” The Australian government business website. All of these involve the idea of change or something new, coupled with improvement or increase in value. So I think I’m happy that the meaning of Innovation is fairly consistent when you look beyond the word at the formal definitions. Some are easier to understand than others. What I think has happened is that the process of Innovating has become such a grand design that it can now only be done with a 155 page strategy document, a think tank and the aim of revolutionising a market in one single step. In other words, it has become nearly impossible to do. Clayton Christensen in his book The Innovator’s DilemmaÂ showed us that the business drivers of our current customers blinds us to emerging but currently unsuitable technology that eventually takes over our market. This has led to a focus on Innovation that looks to be disruptive as its primary goal. And I have come to the conclusion that this has hampered our attempts at Innovation. We have set the bar too high. And this isn’t what Innovation was about. Just a way of looking at a specific type of Innovation. I’m not going to try and reproduce what I learnt at the workshop but instead to share with you the 3 most important ideas I came away with. Innovation can and should be done by everyone! Do lots of small, simple, structured experiments and document them in a consistent manner. You should expect at least half your experiments to fail. Everything else flows from those 3 fundamental ideas. And Frank took the time to lay a proper foundation with lots of examples as well as some models of problem types in order to ensure we understood everything and were able to then go and do it. And the reason half your experiments should fail, is that you are looking to discover something new and so you can’t predict when and how you will find it. Many things can be progressed by removing a small but significant obstacle. The main problem he has is that once he has done this, it looks too simple. Surely Innovation is hard.Â So can Innovation really be done by mere mortals? It seems it can after all. Frank Connolly is the founder of Think Quick and consults to governments and businesses across the globe. The problem with innovation is that it is a word used all the time with the expectation that using the word somehow makes things better. 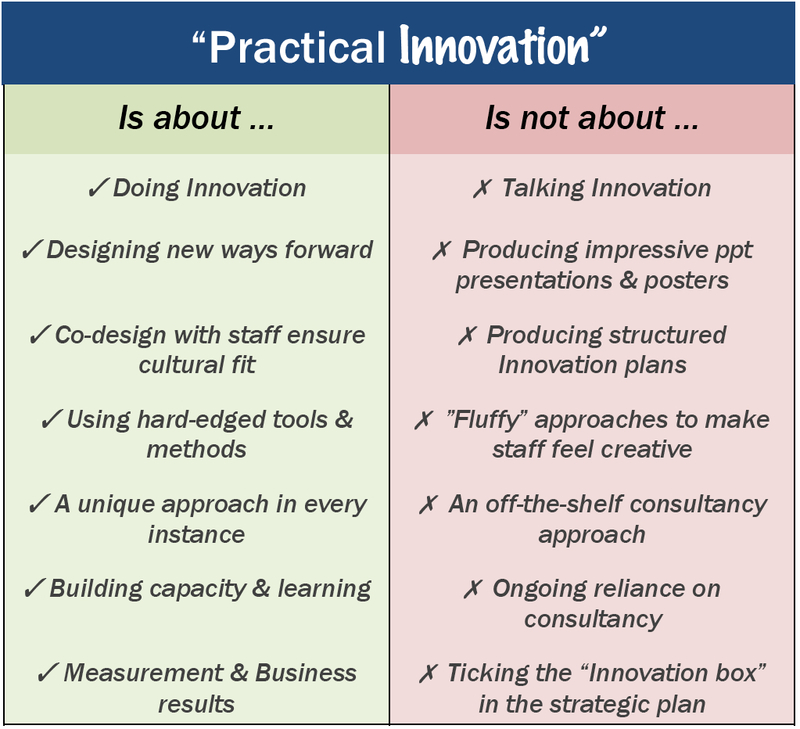 A definition for innovation is a bit harder to nail down. Here are some examples. Change that adds value – Roger La Salle who invented Matrix Thinking and the Innovation Matrix. His latest book is called “Innovate or Perish”! The Australian Government website on Innovation lists the programs on offer but avoids a definition. The graph above shows the need for Innovation on a continual basis and not just a single event. It is taken from Embedding Innovation on the Matrix Thinking website. This is not the sign of a healthy Innovation Environment. The slow decline in Australian Manufacturing is certainly one of the reasons but it seems we have just become less interested in Innovating. I read with interestÂ The Innovation Machine on how a range of different companies ensure innovation happens. Google and 3M are famous for their Innovation strategies which includes employees having discretion over how some of their time is spent so they can pursue things that interest them. The argument in the article however is that Innovation is unnatural, and so you must create an environment that ensure Innovation occurs. In a second article that touches on this point on Israeli Entepreneurs, an Israeli company Optibase has cutting edge video equipment which only exists because of the Israeli military. Staying alive is a powerful motivator and the military are keen for improvements to come from anywhere. Innovation is expected! Our business creates or updates roughly 100 new products each year. So for us, new is normal. And this need makes Innovation essential. This is one of the advantages of working with an external product development consultancy. Even if you have the internal skills to do the work yourself, an external viewpoint will always be different. The ultimate aim is to be able to harness the best of both to get a better outcome than you could from either alone. Innovation can also be stifled and this is not just an Australian phenomenon. I covered this is Prototypes Blunt Innovation. My thanks go toÂ Dr Marc Dussault, The Exponential Growth Strategist for the links which prompted thisÂ post. Prototypes are very useful. We use them all the time when developing new products. They let us try out new ideas explore how well a particular technology will work for a specific application. One danger of a prototype, is that there is the temptation to think that you can then just fix it up to make it into a product. This is a common enough dilemma with software. It mostly works so a bit more polish and it will be OK to ship it.Â This is definitely a danger zone. Once a prototype has served it’s purpose, put it aside. The design the product from the ground up. And then, if you can use any of the prototype design, then do so in a considered way based on the design and architecture you have determined will meet the entire needs of the project. Most prototypes do not have the exception handling and support featured needed to make them into real products that can be tested and maintained. So I was interested to read about another potential problem with prototypes in the December 2011 edition of the Harvard Business Review in an article titled Early Prototypes Can Hurt A Team’s Creativity. The problem outlined is that the prototype can limit the thinking about the project. It is way easier to pick and choose features on a defined thing and critique flaws than to create something new. So the early prototype can really set the team back if they let it define the full scope of how to think about the underlying problem being solved. IÂ have seen the same think happen when a product needs a new model. It is obvious to look at incremental improvements and “Low Hanging Fruit” but sometimes you have to step back and think about the market and the customers and what they really need. Maybe it is time for a clean slate. And maybe there are good reasons why the old technology the product was based on is not the right choice for the next model. In both cases, the prototype and the existing model act as a frame of reference that limits innovation and creativity. The hard part of course, is recognising when that is the case and when it is not. As an example, one project I worked on early in my career involved creating a new international product for a company entering a new market. It was for an existing category and there were 6 incumbents who had been there for a while, in some cases 30 years. The company did something very wise. They sent someone to talk to several opinion leaders and to all the local users of the equipment. The intent was to determine the best way to go about gaining market share. The story told was that none of the existing products met the customer needs really well. Over time they had converged into 2 formats, one for each market segment, and it was a price war as the products had become commodities.Â But when they were asked what they were trying to do, the customers gave 2 clear stories, one in each market segment. The marketing and product specifications were based on these 2 stories and we designed a single product to meet both market segments. The product entered a crowded international market at a price point 50% above the next most expensive product. The company planed to sell 300 in the first year and ramp up after that. The sold 1500 in the first year and had to move to a larger factory to satisfy the demand. I also got a patent for one of the new technologies developed. The point is that if you meet the actual need, people will pay for that. The issue in this market was that the incumbents had let each others’ offerings define their responses and not the customers’ need. Another example of stifled innovation until a new player listened and changed the game.